3 Bedroom, 2 Bath Accommodates 11. Lots of Open Water and Nearby Docks! This newly renovated 3 bed, 2 bath boasts 2 large porches both overlooking the lake as well as an open floor plan, making your families' stay a comfortable one. Downstairs you will find the newly renovated, fully stocked kitchen with all new stainless steel appliances, a master bedroom featuring new furnishings and a queen size bed, a newly renovated master bath with an oversized bath/shower combo and the great room. The great room includes upgraded Dish entertainment on a 55 inch flat-screen TV, a blue tooth sound bar as well as a sectional sofa and a love seat . Additional kitchen appliances include a Keurig coffee maker, blender, four-slot toaster and a crock pot! Also, downstairs, is our previously mentioned party deck! The deck is perfect for any gathering and includes two picnic tables, new adirondack chairs, tiki torches and a gas grill! The grill, replaced in 2017, is great for any avid griller, and the propane is on us! We provide propane to all our guests as a courtesy. You will also find the washer/dryer combo located at the end of the deck tucked away in it's own closet next to the waste containers. Upstairs we have two bedrooms and one bathroom. All beds upstairs are full size. The loft bedroom overlooking the great room sleeps 2 while the back bedroom sleeps 4. Both bedrooms are connected to the upstairs porch and includes seating for 4 people. Additional sleeping cots are located under the double room beds. For your comfort, a window mounted air conditioner has been added to our upstairs double room. All beds in our cabin have recently been outfitted with new 100% cotton hypoallergenic sheets, new comforters and hotel style down pillows! The two beds in our double room are brand new memory foam mattresses! Enough with all the technicalities of the inside, I mean come on... You are at the lake after all so lets talk about that! You're just seconds away from our new all metal dock. The dock was built in July 2018, and we have since added sided bumpers so that your boat is safe! We do recommend adding your own bumpers as a precaution, however. 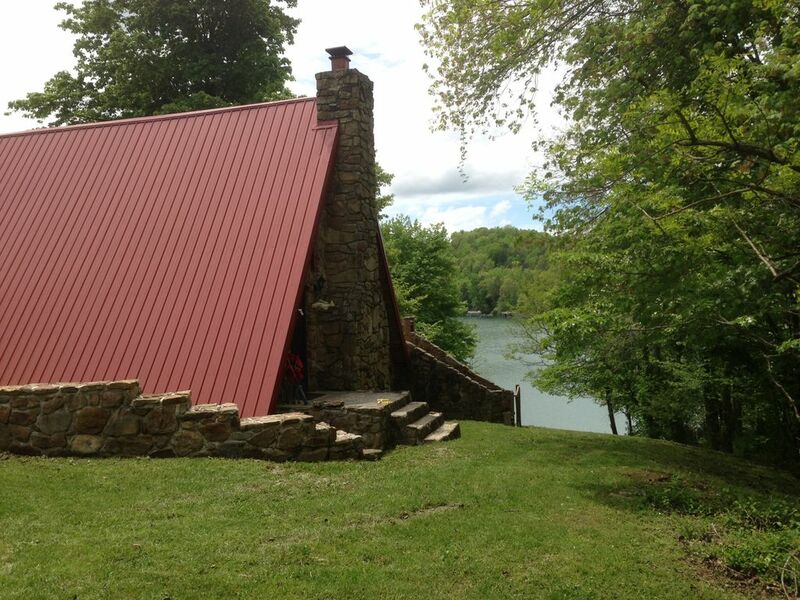 Our cabin is centrally located so it's really easy to get where you need to go by water! Sequoyah Marina is one of the largest marinas on the lake, and you're just a 10 minute (speed) boat ride away! Sequoyah Marina is a full-service marina offering WaveRunners and Pontoon boat rentals. They start off all their weekends on Friday night with their famous "Wing Night" serving the best wings and coldest Corona on Norris Lake! For all your land traveling needs, we're really in that happy medium of just close enough in case you need anything and far enough out to not be bothered by the hustle and bustle of everyday life. You'll be in town in about 20-25 minutes and there you'll find an array of food, grocery shopping, gas stations etc. We offer repeat renter discounts and welcome you to your vacation with a gift basket, setting us out from the rest. Unlike most rentals on Norris Lake, we are from this area and we'd like to think that gives us a little more appreciation and love for this amazing lake. Here, you're not just a tenant, you're a guest in our 2nd generation family home. Come stay with us, and see for yourself why life is always better at the lake. And remember... If you're lucky enough to be on the lake, you're lucky enough! My wife and I live about 15 minutes from the property, making it easy to assist guests during their stay. We are very familiar with the area and always happy to offer suggestions about local entertainment and events! Centrally located so it's easy to get to any area of the lake by boat in a reasonable amount of time. Secluded with only three homes on a cul-de-sac. We're the last house at the end of the road. The way the house is situated you can't see any other homes from the upper or lower deck. Stove/Oven combination. Flat glass top radiant heat. Regular and K cup coffee brewers. Located on Two Large Lots. 500 feet of year round shoreline. 12' X 20' floating dock accommodates two boats. 1 hour 20 minutes from Pigeon Forge/Gatlinburg and The Great Smoky Mountains National Park. 30 minute drive from to Don Sundquist Recreation Area (4 wheel/Jeep/motorcycle trails, hunting, hiking). 20 minutes to Cove Lake State Park. 45 minutes to Knoxville. Cute, clean and tucked away! Great! Just as described! Everything was great. Nice and tucked away. Easy to book and great to work with! This home is adorable!!! The loft bedroom was a hit with our oldest. The walk to the lake is very challenging. Huge hill to navigate. It was quite exhausting. Once on the lake it is gorgeous especially at night. There is a lot of boat traffic all week. Not good for fishing. There is a floating dock if you want to try fishing & it is deep enough to jump off of. Had fun floating especially with the waves but we didn't catch anything. Neighbors are close but there wasn't anyone there during our stay. It was nice to be able to bring our dogs. Now the not so good stuff... The house needs some minor repairs. The door handle to the upper deck from the loft bedroom was very loose & difficult to lock/unlock. The faucet in the upstairs bathroom was broke. The "bar" for the shelves in the fridge were duct taped to hold food in which did not work. Food fell out if you put it in the door. Freezer was the same way. The ant problem was not so bad. The owner did what they could to prevent it but you're in the woods on a lake. There will be bugs but it wasn't bad. There are not many TV channels to view. However we weren't there to watch TV. We ran out of propane for the grill but the owners responded promptly! Overall it was a good stay. If the minor repairs were taken care of I would give this a 4-5 star rating. very nice quiet location house very nice some of the furniture needs replaced. you would have given us a list of the items in the house that you knew were broken. The house was not very clean on our arrival, we spent quite a bit of time cleaning . The grill was very nice however it was very dirty, and had to be cleaned before we could use it At the bottom of the yard almost in the center there is a stump of a tree, there is a nest of yellow jackets in that stump, I know because I was stung several times by them. Your dock needs some repair. We made every effort when we left to leave the property in as good or better condition than we found it. During our stay a young male who identified himself as your son walked in the house on my wife unannounced, he said he knocked on the front door and got no answer so he walked around and entered by the deck door Needless to say my wife was very surprised at seeing someone standing in the house when she came out of the bathroom (not very professional). There is a phone in the house it would have been nice to have received a call to let us know that someone was coming by to pick up property This could have been a very dangerous situation for one or both individuals. We would rent your house again given the opportunity. We had a very nice time and the gift basket and refreshments were a nice touch. Listing description was accurate. Property was clean and taken care of. Beautiful view of lake. We would stay here again. Did have a lot of boat traffic. All the ammenities you need were supplied. As mentioned in previous reviews, ants in the kitchen only were a little bit of a problem. We wiped down every morning which immediately took care of the problem. Never left anything out on the counters. Walk up and down to the lake was a breeze! (compared to 280 steps each way at other places we stayed). Very relaxing. Awesome view. Gift basket was a very nice (unexpected) touch. Thank you. Suggestions: A second TV somewhere maybe upstairs during football season. We did watch movies and play adult games. We had enough entertainment to keep us occupied in the evenings. Took long walks around the friendly neighborhood. Secondly, the chest of drawers in the master bedroom downstairs was full of linens, all 5 drawers. We had to live out to the suitcase, it would have been nice to be able to put things away for a 7-day stay.